BOOK A SWEEP £59 . . . beep! beep! its Pete the Sweep! Sweeping, smoke tests & bird nest removal carried out to the highest of standards. We take the utmost care whilst in your home. When we arrive on site, we will always ensure that we carry out all of our services without causing any mess or dust. So you can rest assured that our professional sweeps will leave your home exactly as they find it. Call today on 07572 872001. Or contact our Service Team using our request form to discuss any sweep request you have. Professional, reliable & friendly chimney sweep service available for both residential & commercial properties covering Brighton & the surrounding area - chimneys swept thoroughly to prepare for the winter season. We can inspect & survey chimneys, carry out smoke tests for solid fuel & gas fireplaces, remove blockages & leave the premises without any mess. Sweeping in the Brighton area 7 days a week, Monday to Sunday. We only fit the highest quality Gas Safe & BS & HETAS standards cowls to meet every situation, to protect from birds, limit flue deterioration, & cure down-drafting. Where fitting a cowl to a square pot we have square cowls made especially for us & also have individual cowls made for specific situations. HETAS recommends that chimneys undergo an annual inspection & cleaning to ensure that it is kept in good condition, fit & safe for purpose. That’s where Pete the Sweep can help. Without regular cleaning, soot & creosote residue can build up, which is one of the major causes of chimney fires. It can also lead to damage, cracks & holes, which could reduce the extraction capabilities & allow hazardous gases & fumes to enter your home. Call today on 07572 872001. Or contact our Service Team using our request form. We provide comprehensive chimney cleaning services, from a simple sweep & test to a more thorough vacuum & inspection to ensure there is no damage or issues. We can also offer fully guaranteed flue lining systems to ensure that your chimney is kept in the best possible condition for years to come. Our courteous & professional chimney cleaners have years of experience & can complete a clean in as little as 40 minutes, including a free clean-up service. Call today on 07572 872001. Or contact our Service Team using our request form. Our friendly team are standing by to discuss your requirements & will happily give you a free quotation over the phone for 1 or more sweeps, Call today on 07572 872001. Once you’re happy with your quote, we will arrange a convenient time to visit you - Or contact our Service Team using our request form. We give appropriate advice & cost effective solutions to a dangerous leaking flue. Professionally installed at a guaranteed fixed price with minimal disruption We fit both gas & solid fuel stainless steel linings, which meet Gas Safe & BS & HETAS standards, Or contact our Service Team using our request form. Requests & Questions / survey requests / bird guards / number of chimneys etc. Sweeping 6 days a week! 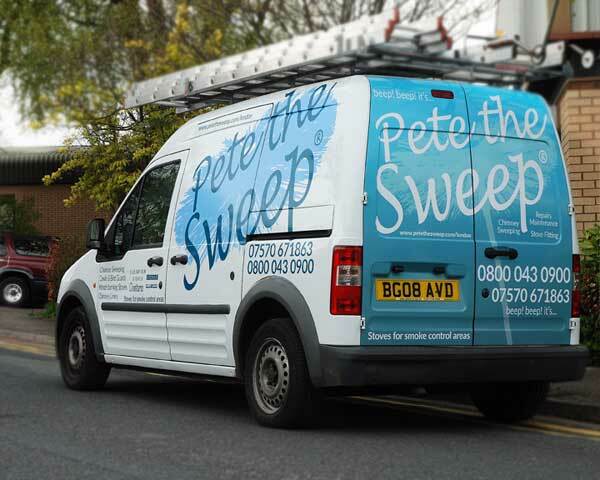 Please feel free to contact Pete The Sweep at any time, we are available to take chimney sweep bookings 5 days a week! When requesting a chimney sweep or survey for chimney work please allow as much notice as possible, in the busy period September the 1st to March 31st we are generally working at least 5-7 days in advance, however we can often fit work around to suit most people. We carry out HETAS certified Wood & Multi-fuel stove installations and are pleased to carry out FREE survey & quotes for this and all Chimney work including flue liners 'opening up' fireplaces hearth work & any chimney related work; all of which can be arranged with our Surveying Engineer. We cover postcode areas: BN1, BN2, BN3, BN5, BN6, BN7, BN9, BN10, BN11, BN14, BN15, BN41, BN42, BN43, BN44, BN45, RH10, RH11, RH12, RH13, RH15, RH16, RH17, RH18, RH19. Our customer service team will aim to call you back to discuss any enquiries you make within 24hrs, we can then book in chimney sweep requests on a suitable day. You will then be sent an email confirmation of your booking for sweeps or any other work discussed and agreed upon. Customer Service Team 07572 872001 .